This N2S-3 was one of a batch of 125 ordered between February-May, 1942. 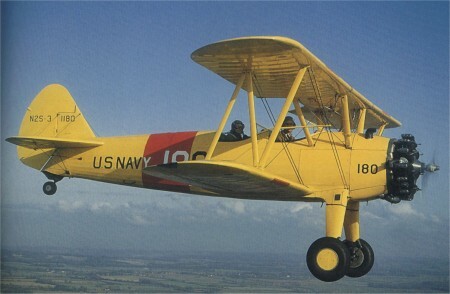 The period that the Boeing-Stearman served with the US armed forces saw several changes in the basic coloring, national insignia and application of identification markings. The changes were reflected immediately on the airplanes at the factory. However, earlier airplanes already in service were updated only partially. The results was that a great variety of markings was to be seen. The most colorful airplanes of this period were the US army trainers built from 1936 into early 1942. These had the blue fuselage, chrome yellow wings and tails and carried distinctive Army tail stripes. Primary trainers of the US Army used blue fuselages and chrome yellow wings and tail surfaces from the late 1920's. Struts and landing gear were also blue. The blue and yellow remained standard until the Spring of 1942 when it was replaced by all-over silver. The Army used some Kaydets for instrument training, but did not apply special markings. Standard Navy coloring for primary training since the 1920's was all-over chrome yellow to achieve maximum visibility. They were nicknamed "Yellow Perils" because of their color and the student pilots in the cockpit. Yellow remained standard throughout the war years. Some N2S-1's and 4's turned over to the Navy directly from Army contracts used the original Army blue and yellow without the Army tail stripes. Others were delivered in an all silver finish. In a few cases silver airplanes flew with removeable metal panels intended for yellow airplanes. The Navy sometimes applied three-foot-wide green bands around the fuselage and chordwise around the wings of primary trainers used for instrument work. A very special Navy marking was used on "Recall" airplanes at Navy primary schools along the Gulf Coast. Since the trainers had no radio, they could not be recalled if a storm or other emergency came up. When it was desired to call them in, a special Kaydet painted with barber-pole stripes was flown to the nearby training areas. The cadets had orders to head for home whenever they saw that plane. Foreign nations that ordered military Stearman 73's, 75's and 76's prior to US entry into WWII specified their own color schemes which usually ran olive drab or brown camouflage. Trainers exported under the US Lend-Lease program were mostly painted in the US Army blue and yellow of the period but carried the foreign markings. Exceptions were the 300 Canadian PT-27 Kaydets which were the over-all yellow that was standard for Canadian primary and advanced trainers.